Below are the official Hockomock League Boys Lacrosse All Stars. FOXBORO, Mass. 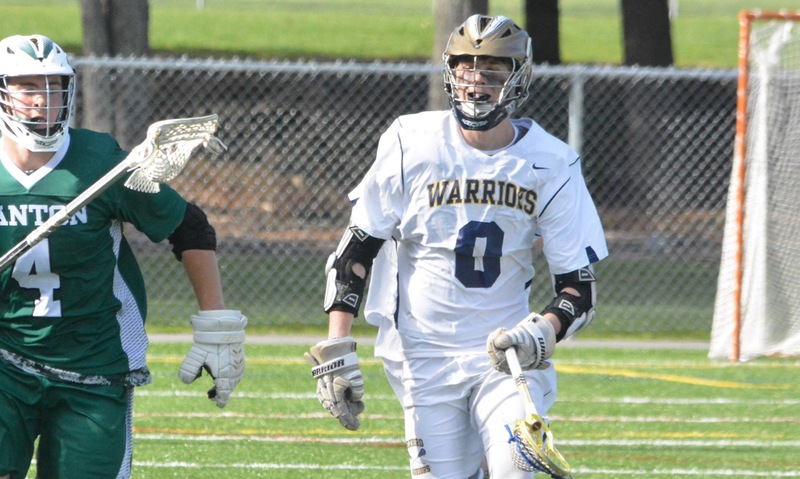 – With 2:38 remaining in the game, Canton senior attacker Ben O’Neil stepped into a shot that seemed destined for the bottom corner. He put his arms up to celebrate what he thought was the go-ahead goal, but then just as quickly dropped them when he realized that Foxboro goalie Jake Addeche had somehow stopped the ball on the line. The game stayed tied and Foxboro transitioned into the attack. The ball swung around to Andrew Whalen who drove at the net and flicked a behind-the-back pass to sophomore Louis Piccolo with time and space. He fired a rising shot just over the stick of Canton goalie Chris Albert (10 saves) and under the bar. Piccolo’s goal with 2:03 remaining, his third goal of the game, handed Foxboro a come from behind 5-4 victory at Sam Berns Community Field and command of the Davenport division at the midway point of the league season. Each of the last three seasons, this match-up has produced games that have come down to the wire. Three years ago, Canton ended a long losing streak with an overtime win on its way to a league title and last year the Bulldogs won by two goals to help Sharon get to the top of the division. Canton coach Bill Bendell saw his team lose a 4-2 lead in the second half, but he also stressed the importance of having this rivalry to prepare his team for making a run in the postseason. Albert made four of his saves in the first quarter alone, as the Bulldogs struggled to mount a sustained attack. Foxboro was also off to a tough start with a number of shots sailing high or wide. But, with the clock winding down Trey Guerrini spun past his first marker, bounced off a second, and then spun a third time before beating the goalie from the edge of the crease at the buzzer. Canton would take the lead in the second quarter by beating the Warriors in transition. Shaun Kirby scored the first of his two goals with a bouncing shot to the far post on a man-down situation to tie it at 1-1. With 4:14 left in the quarter, Kirby would feed freshman Mike Shaw on the break to make it 2-1. The play started with Albert, who made a great save on the other end and then fired a perfect half-field outlet pass to the attackers. Kirby extended the lead to two goals just 47 seconds into the second half with a rip to the bottom corner, but a two-minute locked in penalty to Jake Ragusa offered Foxboro the chance to get back in it. Piccolo scored his first on a rip just under the bar 10 seconds into the EMO, but Canton would answer back 22 seconds later when Joe Mulkay spun middle and bounced a man-down goal past Addeche. The game did not feature a lot of attacking play from either side, as the defensive units were mostly on top. Ragusa and Mike Pigeon were major factors for the Bulldogs, while Bobby Kierce and Brian Buckner continued to make plays for the Warriors. Piccolo would cut the lead to one with 5:32 left in the third with a shot on the run and then three minutes later, Foxboro completed the comeback when Guerrini dodged past his marker to set up Brendan Tully. Foxboro hit the post midway through the fourth quarter and Addeche (six saves) and Albert traded big stops to keep the game tied. Finally, with 2:03 remaining Piccolo found a seam and made no mistake with his shot. “We called a timeout to call pressure defense down by a goal and we just didn’t execute it. We usually do,” said Bendell. 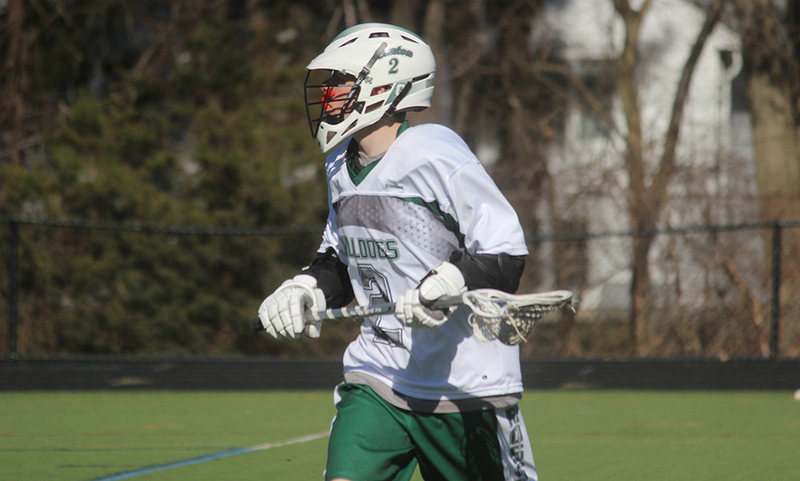 Noone called Piccolo a “goal-scoring machine.” The sophomore was coming off a career-high, 11-assist game against Milford on Wednesday, but Noone shook his head when asked if that game (a 25-1 win) had any positive impact on how his team played on Friday. The Warriors (7-2, 5-0) have the edge in the Davenport at the moment, but have several tough games coming up in the league and Bendell knows that Canton (4-4, 2-4) has important games coming up to stay in the mix. 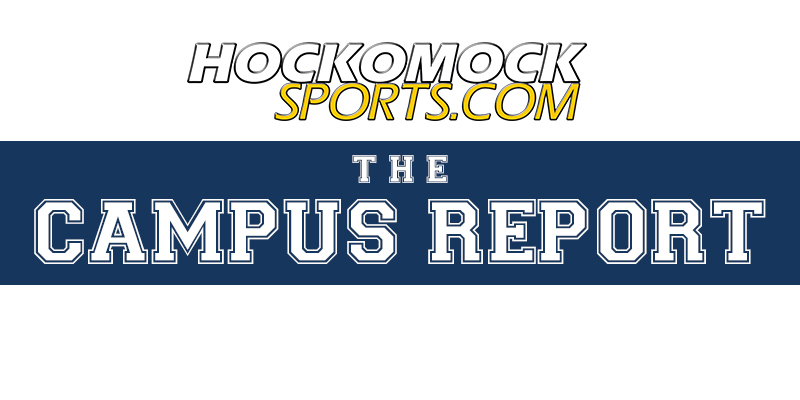 It was recently announced that five Hockomock football players have been selected by the Massachusetts High School Football Coaches Association to take part in the annual Shriners All-Star Classic on Saturday, June 18 at Cawley Stadium in Lowell. The five players are Nick Morrison of North Attleboro, Kyle Murphy of Attleboro, Jake Ragusa of Canton, Austin Ryan of Foxboro, and Josh Schafer of Mansfield. The annual all-star game pits graduating high school seniors from teams in the North and the South and raises money for the Shriner’s Hospital in Boston. Through the years, the MHSFCA has donated more than $1 million through its all-star game. The players were nominated by their coaches and then selected by the coaching staffs that were elected by the MHSFCA to run the game. The South team will be coached by Northbridge head coach Ken LaChapelle, who also coached the team in 1999. Johnson knows all about the Shriners All-Star Classic, as he and Mansfield coach Mike Redding both represented North Attleboro in the first game in 1979, which was held at Boston College. Redding added that Schafer was selected for the National Football Foundation Scholar-Athlete award, which recognized his work on the field, in the classroom, and for his community service. Schafer will be joined at the may banquet by Foxboro senior Connor Downs. Murphy was a three-year starter and a two-year captain for the Bombardiers and Attleboro coach Mike Strachan credited the senior lineman’s work in the off-season and in the weight room for getting him to this point. Strachan said, “Kyle is truly a gifted athlete and even a better person. Kyle has been a solid leader for us on and off the field the last two years and his leadership will be missed. Ragusa, a three-year player for Canton, was named the Davenport MVP and the HockomockSports.com Player of the Year for the Bulldogs this past fall and now can add the Shriners’ game to those honors. He will also be continuing a program and a family legacy when he takes the field in June. Ragusa’s father Doug also played in the Shriners’ game in 1986. The Shriners All-Star Classic will be held on June 18. For more information, visit http://www.mhsfca.net/shriner-classic.html. CANTON, Mass. 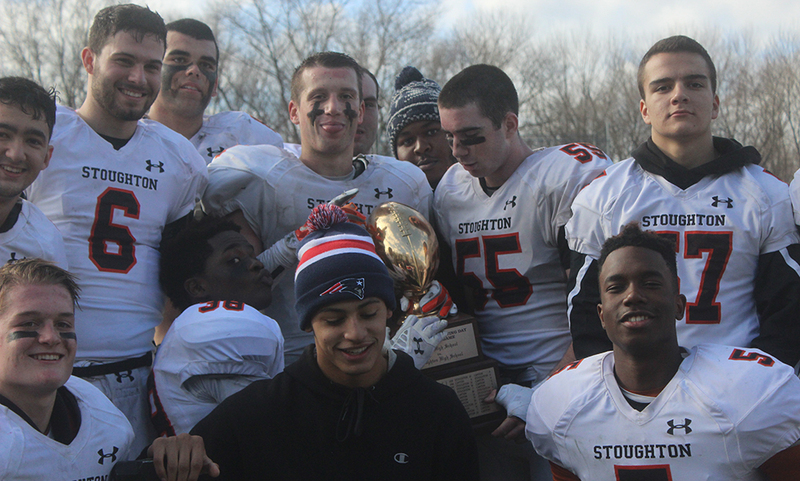 – For the third straight year, the Thanksgiving trophy is headed back to 232 Pearl Street. Stoughton scored a pair of touchdowns in each half to pick up a 26-13 win over Canton on Thursday morning in the 90th annual holiday meeting between the two neighboring rivals. Stoughton senior Jake Gibb capped a tremendous career for the Black Knights, throwing three touchdowns, including two in the second half. Gibb tossed a touchdown to Izon Swain-Price on the opening drive of the game and linked up with the junior again late in the fourth quarter to secure the Black Knights’ third straight win on the holiday and avenge an overtime loss to the Bulldogs in the regular season. “I was really happy with the line, I think we moved the ball when we had to and we had a couple of nice passes,” Stoughton head coach Greg Burke said. “Canton’s tough, they come at you hard. [Jake Ragusa] is one hell of a player, I’m glad I don’t have to see him again that’s for darn sure. Hats off to them. All I know is that the turkey will taste good today. A squib kick to start the game set the Black Knights up at their own 41 yard line and five plays later, the Black Knights took the lead. Facing 4th and 8 from the 35 yard line, Gibb connected with Swain-Price on the right sideline and he was able to turn up field and get into the end zone for a 7-0 lead. Both defenses stood tall for the rest of the first quarter. The Bulldogs were forced to punt on each of their first three drives thanks to two big third down sacks from Guy Eddy. Canton’s defense was stout though as Stoughton sandwiched two punts around a lost fumble on their next three possessions. Thomas Monagle’s punt pinned Stoughton at their own five yard line and after Canton’s defense held up, they took over at the Stoughton 40 yard line after a Black Knight punt. The Bulldogs took just five plays to find the end zone when Woanyen Mahn (13 carries, 68 yards) burst through a gap up the middle, shred a tackle and raced into the end zone to make it 7-7 with just over a minute to play in the first half. Despite little time to work with and starting at their own five yard line, the Black Knights got some life right before the halftime break. On the first play, Christian Hill got around the edge on the left side and sprinted 87 yards to get to the Canton eight yard line. Two plays later, Eddy took the toss to the left and broke the plain while diving into the end zone to make it 14-7 with just 30 seconds left in the half. Neither team was able to add points to the scoreboard in the third quarter. Stoughton turned it over on downs and had a punt while Canton punted and turned it over on a fumble. The Black Knights took advantage of another turnover, this time when Steven Elice picked off Dennis Ross late in the third quarter. Gibb found Elice for a 24 yard gain on the first play of the drive to set up first and goal. On the first play of the fourth quarter, Gibb connected with Eddy out of the backfield for an 8 yard touchdown to go up 20-7. Canton put together its best drive of the game and answered right way. The Bulldogs went 54 yards over 10 plays to pull within one score. Behind a strong rushing attack from Hockomock League Davenport MVP Jake Ragusa (24 carries, 126 yards), the Bulldogs found themselves facing a 4th down at the Stoughton two yard line. Canton coach Dave Bohane called Ragusa’s number and the senior muscled his way up the middle for a touchdown. Canton went for two but the Black Knights were able to make the stop, bringing the score to 20-13. But Stoughton quickly answered again. On 2nd and 3rd from the Canton 37 yard line, Gibb went play action and floated a pass along the left sideline. Swain-Price, who came out of the backfield, turned on the jets and got underneath it and raced in untouched to make it 26-13 with just over four minutes to play. It was a fitting way for Gibb, who has started under center for the black and orange since his sophomore year, to finish his career. Over three years, Gibb tossed 29 touchdowns, including nine his senior year. He almost didn’t have a chance to compete his senior season after suffering a shoulder injury in the first half of the first game against North Attleboro. After missing a couple of games, Gibb returned and each week has been able to do more. Canton pushed to try and get within a score again but a host of Black Knights stuffed a fourth down attempt from the Stoughton 26 yard line to get the ball back. Both the Black Knights and the Bulldogs finish the season with 6-5 records. Stoughton now has a 46-40-4 lead in the Thanksgiving series.